Over the past few years, the market of therapeutic plasma exchange in the US has witnessed stable growth. Due to the growing awareness among physicians, therapeutic plasma exchange is increasingly being adopted in the treatment of rare diseases such as Guillain-Barré syndrome, thrombotic thrombocytopenic purpura (TTP), Goodpasture’s syndrome, and Wegener’s Granulomatosis. This trend is expected to continue in the coming years as well. A surge in geriatric population in the US and subsequent increase in the incidence and prevalence of chronic lifestyle diseases is expected to drive the demand for therapeutic plasma exchange for the treatment of some of the rare neurological, hematology, renal, and autoimmune disorders in the U.S. The growth of the overall market in the U.S. can be attributed to the accessibility to technologies, superlative opportunities for Therapeutic Plasma Exchange procedures in rare disorders, established distribution channels, and the presence of a large number of market players such as Haemonetics Corporation (U.S.), Fresenius Medical Care (Germany), Terumo BCT, Inc. (U.S.), Baxter International Inc. (U.S.), Asahi Kasei Medical Co., Ltd. (Japan), Kawasumi Laboratories Inc. (Japan), B. Braun Melsungen AG (Germany), and HemaCare Corporation (U.S.) in the country. This research report categorizes the US therapeutic plasma exchange market on the basis of indication. The report also provides information on the total number of patients undergoing TPE procedures, average number of procedures per patient, and total number of TPE procedures performed in the U.S. (2015). Detailed analysis and profiling of market players such as Haemonetics Corporation (U.S.), Fresenius Medical Care (Germany), Terumo BCT, Inc. (U.S.), Baxter International Inc. (U.S.), Asahi Kasei Medical Co., Ltd. (Japan), Kawasumi Laboratories Inc. (Japan), B. Braun Melsungen AG (Germany), and HemaCare Corporation (U.S.). In this study, the US therapeutic plasma exchange market is segmented on the basis of indications. The research report discusses the total number of patients undergoing TPE procedures, average number of procedures per patient, and total number of TPE procedures performed in the U.S. (2015). 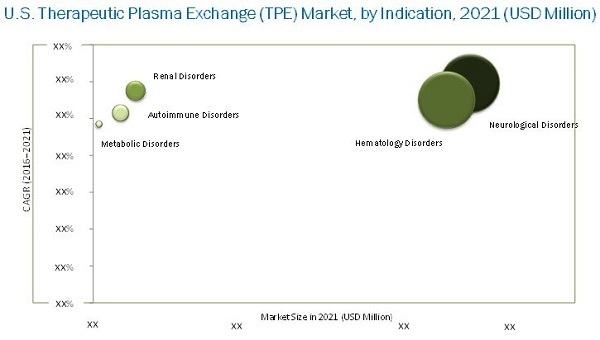 The market for US therapeutic plasma exchange is broadly segmented into neurological disorders, hematology disorders, renal disorders, autoimmune disorders, and metabolic disorders. In 2015, the neurological disorders segment accounted for the largest share of the US therapeutic plasma exchange market; this segment is also projected to grow at the highest CAGR during the forecast period. The growing prevalence of neurological diseases; increasing clinical response rate for therapeutic plasma exchange in Guillain-Barré syndrome, chronic inflammatory demyelinating polyneuropathy, and myasthenia gravis; and growing prevalence of multiple sclerosis in the U.S. are driving the growth in this market segment. The major players in the US therapeutic plasma exchange market are Haemonetics Corporation (U.S.), Fresenius Medical Care (Germany), Terumo BCT, Inc. (U.S.), Baxter International Inc. (U.S.), Asahi Kasei Medical Co., Ltd. (Japan), Kawasumi Laboratories Inc. (Japan), B. Braun Melsungen AG (Germany), and HemaCare Corporation (U.S.). 4.4.1.4 Asahi Kasei Medical Co., Ltd.